Apply a bilateral filter to reduce the color palette of the image. Convert the original color image to grayscale. Apply a median blur to reduce image noise in the grayscale image. 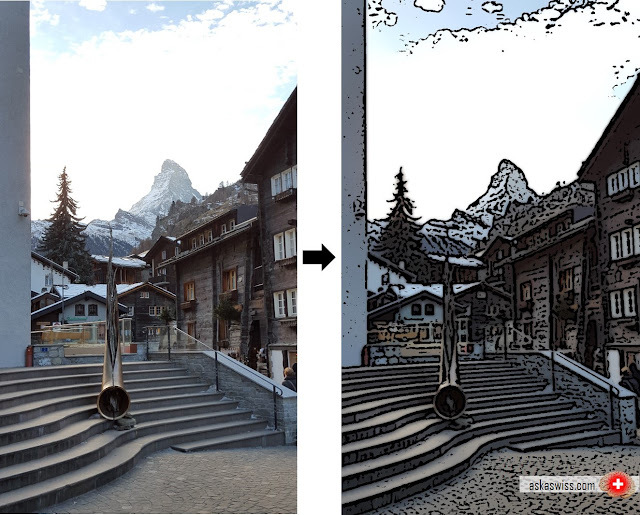 Create an edge mask from the grayscale image using adaptive thresholding. Combine the color image from step 1 with the edge mask from step 4. The three parameters in cv2.bilateralFilter control the diameter of the pixel neighborhood (d) and the standard deviation of the filter in color space (sigmaColor) as well as coordinate space (sigmaSpace). The complete source code is available for free on GitHub (refer to the Cartoonizer class in the filters module). For a more detailed explanation, please refer to the book OpenCV with Python Blueprints.